If you are in the Brookings Oregon area please visit our Brookings Wholesale Coffee page. Customers in Gold Beach, Pistol River and Brookings Oregon receive additional discounts and services. Welcome to Nectar of Life Coffee Wholesale. 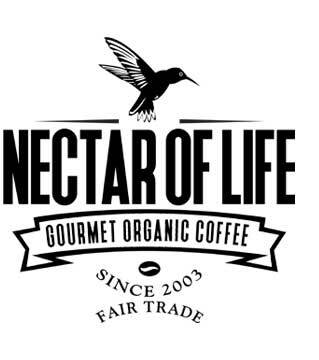 Nectar of Life Coffee Company was founded in November 2002 and has become a leader in providing the highest quality organic Fair Trade coffees on the market. We have many wholesale options for our gourmet, organic Fair Trade certified coffees. Whether you would like a custom blend developed for your café, or would like single pot packs and coffee service for your office, we're your coffee roaster. 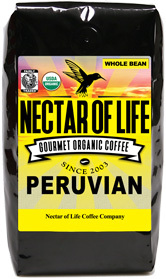 Nectar of Life packages coffee in a variety of sizes, from 2.2oz to 5LB and everything in between. We can supply coffee in bulk 5LB bags, or we can offer coffee service, single-pot fresh packs. We can also create custom, single serving packs to meet your specific equipment needs. Nectar of Life is an authorized Bunn and La Pavoni equipment dealer. We can help you choose the right equipment for your business and provide competitive prices. If you are located on the Oregon coast we can incorporate equipment leasing into the price of the coffee (non-espresso equipment.) If you are interested in starting a café, or espresso stand feel free to give us a call at (541) 661-5563. Ultimately it is up to the barista, or café owner to dictate the style of your beverages, but everyone needs a place to start. 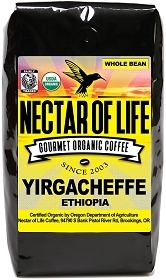 Nectar of Life is equipped to train your staff in the proper methods of coffee preparation. From preparing espresso drinks, to brewing proper drip coffee, we've got you covered. All of our coffees are the highest quality species, Coffea arabica, we NEVER use the inferior species, Coffea robusta. All of our coffees are shade grown, organic and Fair Trade. We have extensive organic coffee offerings, but we can also develop a custom blend for your business. All coffees are roasted after an order is placed (we do not inventory roasted coffee) and immediately heat sealed in foil laminate, degassing valve equipped bags. Unsurpassed Freshness! You can come to our roasting facility (by appointment only) and taste through numerous coffees. We can develop a custom blend to represent your business' tastes. We can even package your custom blend in 1LB or 10oz packages with your own custom label for retail sales. By offering your custom blend packaged with your private label you help build brand recognition and increase your bottom line! In addition to our stellar coffees we can provide Point of Purchase (POP) materials with information regarding our coffees and Fair Trade. For more information please use our Contact Form and type "WHOLESALE" in the subject line. If you would like to speak with someone on the phone you can contact Hannah Jennings at (541) 661-5563 ext. 2. If you would like to inquire about creating a custom blend or espresso training, please call Martin at (541) 661-5563 ext. 3. Thank you for visiting, and remember, if it's not Nectar, it's not worth drinking!